in collaboration with Boston Dynamics, Inc.
RiSE V3 is part of the overall RiSE Project. Robotic Pole-climbing Quadrupedal Robot: Unlike RiSE V1 and RiSE V2 this newer version adopts a quadrupedal configuration, and was designed by Boston Dynamics, with input from the RiSE Project consortium. RiSE V3 uses brushless DC motors that increase power density. 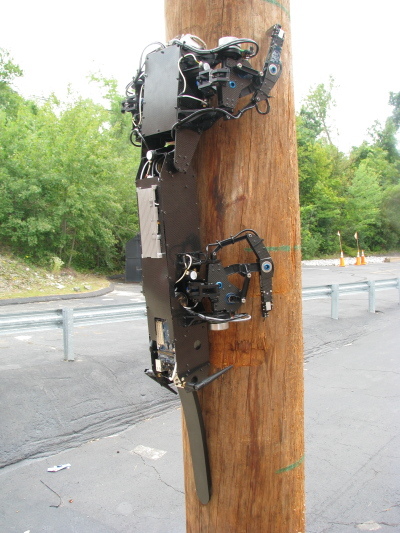 Coupled with a dramatically different leg mechanism and unique gaited behavior, this robot exhibits rapid climbing (upwards of 22 cm/s) up a vertical surface such as a telephone pole. Ongoing work will study locomotion on horizontal terrain, as well as climbing on a wide variety of surfaces.